On Thursday, December 1, 2016, we commemorated those taken by HIV/AIDS, and we stood in solidarity with those affected by it. According to UNAIDS, 36.7 million people around the world are living with HIV. It is estimated that only 46% of these people have access to treatment and in 2015, 2.1 million people became newly infected with the virus. Although these stats are alarming and may seem disheartening, World AIDS Day also gave us an opportunity to celebrate how close we have come to finding a cure. As millions around the world participated in World AIDS Day events, scientists at the Hebrew University in Jerusalem came ever closer to distributing their newly developed drug that could decrease the HIV virus count in the blood of an HIV patient by as much as 97%. This is a revolutionizing development as the current treatment for the virus – a cocktail of various drugs – only slows the progression of the infection in the body, allowing doctors to treat AIDS as a chronic illness while never fully eliminating it. As we gathered at Congregation Kol Ami to view a screening of “Who’s Gonna Love Me Now?“, one couldn’t help but notice the various people who had joined us for the event. Sitting in the audience were people from all walks of life, religions, ethnicity’s, organizations, government branches, and countries, who had come together in solidarity for World AIDS Day. The documentary followed the life of Saar; a gay Israeli man living with AIDS in London, and the reconciliation process between him and his orthodox family in Israel. No matter the person, every audience member that night was able to relate to this story. The documentary’s themes of love, compassion, forgiveness, and empathy are ideals that everyone, no matter their background, has sought at one point or another. It reminded us that our similarities are greater than our differences, and when one of us is afflicted by tragedy, we all suffer. These similarities are what we need to focus on. Unfortunately with the recent serge in global anti-Semitism, that is being led by the BDS movement, it is becoming increasingly difficult for some people to see these similarities. Instead, universities and colleges across the country have become hotbeds of anti-Semitic rhetoric and breakthroughs like those of scientists at HU are being ignored. Can you imagine a movement so full of hate, that it would do anything to influence people to boycott a cure for AIDS, just because it comes from Israel? That is exactly what we have in the BDS movement. It is a movement that would rather see Israel disappear, than see 36.7 million people cured of HIV/AIDS. We must never let BDS succeed. 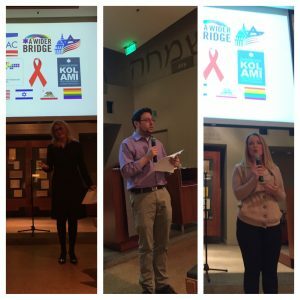 We want to thank Congregation Kol Ami, A Wider Bridge, and the IAC Los Angeles, for making this year’s World AIDS Day event possible. Thank you to everyone who attended and for coming together for this vital cause. We want to encourage our community to focus on the similarities we have with others, and to be examples of compassion. We also want to encourage everyone to take a stance against the BDS movement so that it never accomplishes one of its antisemitic-based goals: to halt vital Israeli developments in medicine.